Troublemaker by Linda Howard is a 2016 William Morrow publication. I was provided a copy of this book in exchange for an honest review. 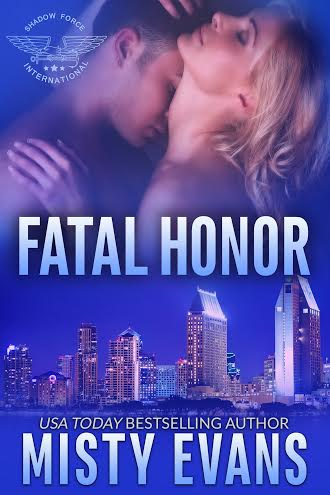 It is so nice to see a brand new romantic suspense novel by Linda Howard! Morgan is a member of the exclusive GO-team, and an operative who has been shot, resulting in a heart attack, and is now in need of a place to lay low after his cover was compromised. Bo is the chief of police in a small W. Virginia community, trying to pull herself out of a financial bind, and mostly living a quiet, peaceful life…until a man shows up at her home, obviously in pretty bad shape, claiming her former step-brother sent him. Initially, Bo was irate, but if she will simply allow the man to stay with her until he gets back in shape and the danger he is in has passed, she stands to earn enough money to pay off her debts. 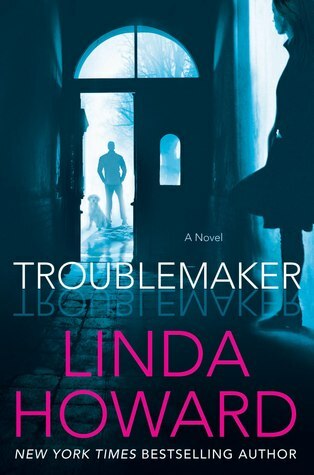 This story is quintessential Linda Howard and I really enjoyed reading this romantic suspense novel written in the style I grew up with, but this story shows a new side of Ms. Howard, which is a little softer around the edges, shows more restraint by building the romantic tensity slowly, and allowing the mystery to float in the background for a while, then revving the suspense up to an action packed finale. 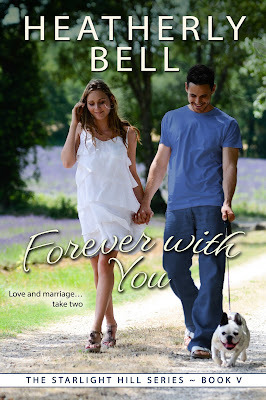 Also, on tap is the author’s trademark humor, but in this story she adds in a sweet small town romance element, and a loyal dog named Tricks, you will fall in love with. I’m trying to remember if I have read a romantic suspense novel with this unique combination. It may seem like an odd pairing, but it works. Bo is a character I admired a lot because she has a high ranking position, and despite her sad background, she isn’t bitter, just cautious. I liked her attitude, the way she loves her job, her duties, and how she handled the situations she was faced with aplomb and a respect for the people she works for. Morgan is a bit of an enigma for a long while, but what I loved about his story was seeing him settle into the small town life, his companionship with Tricks, and how he falls in love with Bo. The change in him is interesting and fun to watch. The suspense and mystery lies in the uncertainly of who Morgan’s enemies might be. It’s a real puzzle and it takes a long time for information to develop in this area, but once it does, things get tense in a hurry. 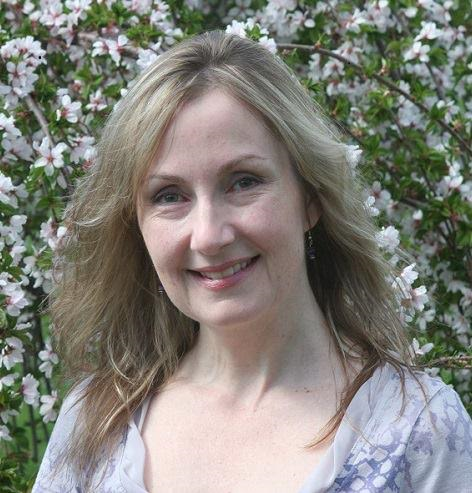 Linda Howard is an author I have followed for many years, and I have always liked her style, and have read many of her books. This story is pretty much what I would expect from her, only better. If you are a long time fan, I think you will be happy with this one. If you have yet to discover this author, this will be a nice introduction. 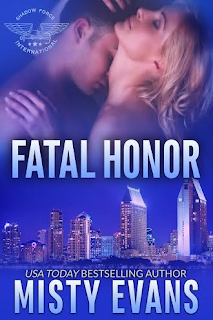 This story will obviously appeal to romantic suspense lovers, but contemporary romance fans will like this one too. A Lowcountry Wedding by Mary Alice Monroe- Feature and Review + Giveaway! I have been eagerly anticipating this return to Sea Breeze, and reconnecting with the Muir’s. Two of the Muir sisters, Harper and Carson, are getting married!! Or are they?? If Carson can make something complicated you bet your bottom dollar, she will, and she tries Blake’s patience, and mine, as it seems she still has some things to work through before she can totally commit to marriage. Sounds like classic Carson, right? Harper allows Granny James to interfere which causes trouble with Taylor, and Dora continues to put Devlin off about their future. 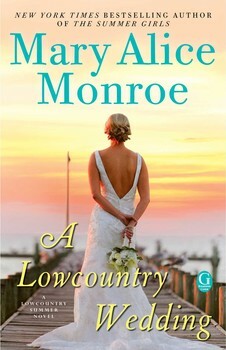 Meanwhile, MawMaw has been bitten by the romance bug herself, and Granny James feels like she has no place to land, since MawMaw moved out to the cottage, a place she always thought would be hers, eventually. With the ladies making wedding plans, and struggling with doubts, and upheavals, a surprise visit from a minister, which could set off a scandal of epic proportions, instead becomes a soothing balm for the girls by becoming a voice of reason by offering sane opinions and advice. Emily Post was the supreme authority on etiquette and MawMaw still holds onto those protocols, and old fashioned southern traditions that she attempts to pass along to her granddaughters as they prepare to enter that all important institution of marriage. The most interesting advice given to brides to be, adds a charming factor to the story as old values blend with new ones. Sometimes they clash, but in the end, the ladies once more learn to give and take, to work together, to do what families do, and the results are amazing. This last book in the series packs the same emotional punch as in the previous installments, but there were some genuine moments of mirth, a few ironical situations, and as all the pieces began to fit together, once and for all, I felt like popping the cork on a bottle of champagne and celebrating with the Muir’s. As the finale arrives, a real sense of peace settled over me, but not without a few bittersweet and poignant moments, as remembrances, memories, and some permanent, but necessary goodbyes must take place. This series has turned out to be one of my favorites of all time. 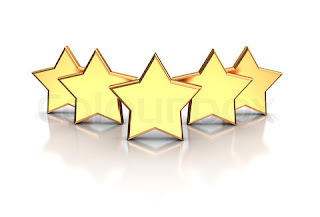 I have enjoyed this journey with Carson, Harper, and Dora. I’ve shared their fears, doubts, frustrations, and struggles. I’ve watched them all fall in love, grow up, spread their wings, and land back where they all belonged from the start. I’ve been angry, frustrated, laughed and cried with all these intimately drawn characters, each with foibles, but all of them filled with inner strength and love. But, the most rewarding part is finally seeing the sisterly bond which had all but disappeared, build over time until these fine women, with the help of one very special lady, found their way back to one another, learned to lean on each other, and support each other, and will no doubt share that bond with future generations. I do recommend reading these books in order, because there is too much very important backstory you simply have to know in order to experience the full pleasure of this series. That being said, I can’t recommend this series highly enough. ONE SALE EVERYWHERE MAY 3RD!! A Taste of Texas is a new Meme here at The Book Review. I’m from Texas, obviously, so I thought it would be appropriate to spotlight the incredible authors who are from Texas or have featured Texas in their books. 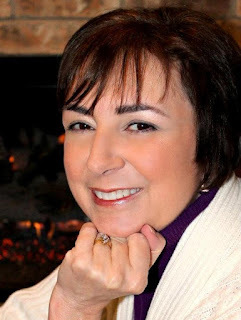 Once a month, I will spotlight one such author. 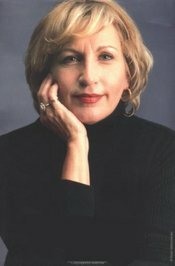 When she received her BA degree in psychology from the University of Texas, she had no idea she had gained a foundation that would help her to create believable characters—characters that are often described as “real people.” She began her career writing training manuals and computer code for the IRS, but something was always missing. 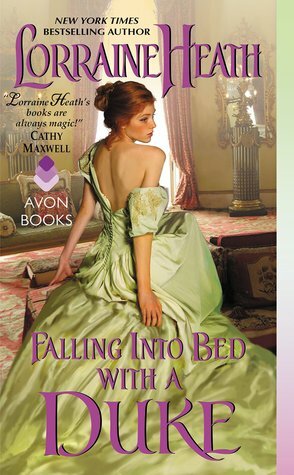 When she read a romance novel, she became not only hooked on the genre, but quickly realized what her writing lacked: rebels, scoundrels, and rogues. She's been writing about them ever since. Her work has been recognized with numerous industry awards including RWA's RITA®. 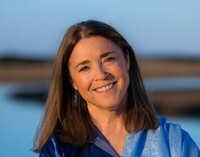 Her novels have appeared on bestseller lists, including USA Today and the New York Times. 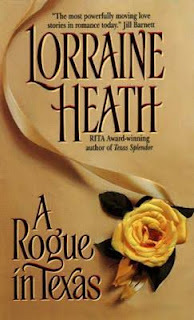 Always to Remember by Lorraine Heath is a 2010 Harper publication. This retro-romance novel was originally published in 1997 by Jove. Set in Texas, post-civil war, the story centers around a young widow, Meg Warner and Clay Holland, a man who refused to join sides in the war or fight in it. Meg’s husband and brothers were killed in the war, and Clay was held prisoner for being a dissenter. He should have been executed for his beliefs, but his life was spared. Returning home to his younger twin brothers, Clay tries to put his life back together, but Meg is infuriated that her husband’s best friend, has returned home alive, a yellow coward, while her husband died. Revenge is a dish best served cold, as they say, and Meg believes she has come up with the best way to punish Clay. Since he is so good at carving stone, he must make a memorial for those men who gave their lives for what they believed in. He must carve each name into the granite and face his own cowardice and dishonor. Meg will supervise him and watch his suffering with righteous indignation. But, something begins to happen between Meg and Clay as they spend more time together. Could Meg have been wrong about Clay? Will she discover Kirk’s true feelings about Clay and his stand against the war? Is there some way Clay can prove to Meg he is as honorable as those who fought, and show her he is not a coward? Back in this era of time, standing up and refusing to join in the fight was unheard of. No one understood how brave Clay was for sticking to his own convictions. That is not the way people viewed things back then. But, for Meg this is personal. She hates, hates, hates Clay for being alive while her husband, who did the right thing, in her eyes, is dead. It’s a bitterness that has settled into her bones, giving her something to hold on to, and she does so with a vengeance. But after a time, her repetitive mantra seemed like a way to remind herself, she was supposed to despise Clay, but he made it very difficult for her. Clay is brave, of course, because he went against the grain, spoke out about his beliefs, by thinking the war was a big mistake. He paid dearly for this stance, and even though he managed to avoid the firing squad, his life is miserable because he is a pariah. But as he regales Meg with stories of he and Kirk’s adventures before the war, and as Meg sees him care for his brothers, and work with his hands, her heart slowly begins to soften and the man she sees now, is not who she believed him to be. In fact, he may be one of the most courageous and honorable men she knows. This is a very good story, with a strong message woven into it, one that speaks of adhering to one’s values and beliefs, no matter what the personal cost. It’s a powerful, thought provoking tale, but also one of those strong examples of love’s power to heal, bring forgiveness, break down walls, and melt hearts. I really wish more stories were written like this one! 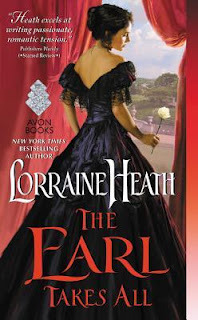 The Earl Takes All by Lorraine Heath is a 2016 Avon publication. I as provided a copy of this book by the publisher and Edelweiss in exchange for an honest review. Sometimes you know from the start things are going to end badly. Yet, despite everything, I had to look, had to listen, had to know, even if my heart was on the line, knowing full well I would need a super-size box of tissues to get through it. The setup is wrong on so many levels, I don’t even know where to start. Perhaps at the beginning? Julia and Edward share a kiss that rocks both their worlds and leaves a long lasting impression. But, Julia believed she was kissing Albert, Edward’s identical twin, and is furious at him for taking advantage of her. Not a great way to start a relationship with your future sister-in-law. But, the die was cast, and the awkwardness remained until Edward was killed. Only Edward didn’t die, it was Albert. Albert’s dying wish is for Edward to pretend to be him until Julia gives birth to their child. It would only be for a short time and then he would tell her the truth. This set-up is obviously pretty tricky, but you must keep an open mind because the author did a spectacular job of walking across a tightrope without a net. You have to trust me on this one, and believe me when I say she never took one misstep or lost her balance from start to finish. Forbidden love, a heartbreaking deception, cruel and downright strange British laws, all team up against the power of love and wins a few significant battles along the way, but of course true love will win the war… eventually. Wow! This story is tense, daring, emotionally charged, and may be the most sensual story I’ve read in a long time. Albert is most certainly an honorable and noble man who loved Julia with all his heart, and only wanted her to be happy. So, his demise is going to be hard to comprehend, and you may be tempted to close your minds and hearts right then and there. But, I beg you to reconsider, because in no way is the love shared between Julia and Albert diminished or dishonored. Edward and Julia’s love story is nothing short of epic. The feelings they have for each other transcends boundaries and all obstacles, refusing to be contained for anyone. The characters are human and real, caught in a trap they have no way of escaping- a damned if you do, damned if you don’t situation. They can live a lie, cheat Albert’s memory, hide the truth from his daughter, allow Edward’s reputation to remain mired in scandal, or they tell the truth and lose any and all chance of happiness. Love brings out the best in us, but also the worst. The consuming desire to finally be with the one person you have always loved, the only one you will ever love, or having a second chance at real happiness, could be a temptation impossible to deny. If you have ever been in love, you know what a powerful drug it is, which can have you rationalizing your decisions, even if you know deep down it's not the right thing to do. I realize the plot may be hard for some to wrap their heads around, and there were some moments where I thought a line was blurred, but once all was said and done, it came together beautifully, with every character able to hold their heads up high, with their reputations intact, blazing new trails, and paying tribute to those who left us too soon, by making sure their memory was honored. I rarely gush over a book, but this one is worth it. Kudos to the author for daring to challenge us, for keeping the genre fresh by adding in a dash of true scandal, and a bit of controversy, but mostly for writing a moving story, with depth and feeling, that really touched my heart and left tears standing in my eyes.